Your email’s subject line is, simply, the most important thing you’ll write in an entire message. Why? More people will read your subject line than any of the inside text – and they use that three-second first impression to determine whether they’ll even click on your email or not. You only get one chance, and it could decide the fate of your entire marketing campaign. The subject is your email’s “headline,” and just like blog post headlines, that’s where it lives or dies. With that in mind, it’s no surprise email marketers spend plenty of time looking for ways to make their subject lines more powerful. For example, personalization continues to be an effective tactic. According to HubSpot's Science of Email report, emails including the recipient's first name in the subject line had higher clickthrough rates than those that did not. As with anything in marketing, you should be measuring performance of your subject lines and making adjustments to your strategy. This is why, as MarketingProfs's research found, 47% of marketers say they sometimes test alternate subject lines to optimize email performance. Luckily, you don’t have to be the world’s top direct response copywriter to make your emails more effective. Even small improvements to your email subject lines can yield big bottom-line returns. And you can achieve these improvements with user-friendly, affordable tools. Each of the following tools is free and incredibly easy to use. The more you test these tools out, the more you'll learn about what your preferences are and find one that best suits your needs. 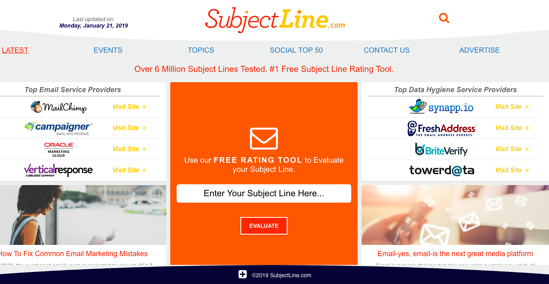 Touted as the #1 free subject line rating tool, SubjectLine is a must-have for all marketing teams. This tool evaluates any subject line according to email marketing best practices and gives you an instant score. The score ranges from zero to 100, but you get much more than just some arbitrary score. It also provides context on why your subject line is under 100 points. For example, if your subject line fails to entice users, you might get docked points for not creating a sense of urgency. You also get actionable advice immediately, so you can continue tweaking your subject line until you get the results you want. CoSchedule's free Headline Analyzer is an excellent resource for improving your headlines. This helps marketers nail their blog post titles, but it can also be used for email marketing purposes. The tool digs deeper on how you structure your subject lines and what kinds of words you're using. Are you balancing the words you use? How effective is your use of words that are emotional or powerful? Is your subject line easy to digest? Your score provides you with plenty of awesome insights. It helps you tweak the reading level as well as the “word balance” – helping you tap into audiences with more evocative words. Plus, you can easily compare past headlines. 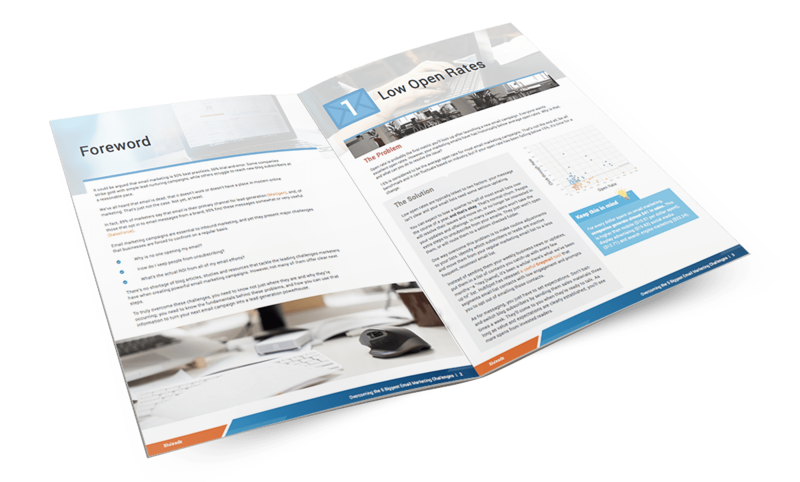 This way, you can test different variations and record how higher-scored subject lines fare against lower-scored lines in terms of open rates and overall engagement. Concerned that your message might be going over your readers’ heads? 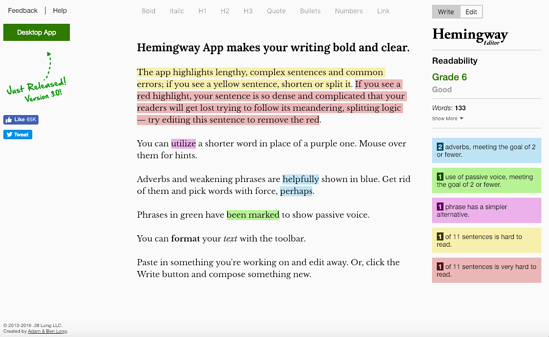 Inspired by the man most celebrated for his short sentences, the Hemingway App focuses-in on the readability of any content you create. In fact, this is a tool many marketers use to analyze their entire blog posts. 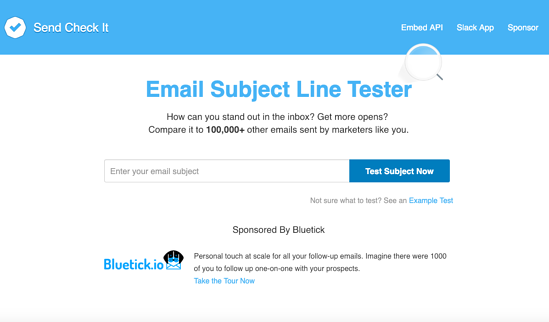 In the context of subject lines, this tool can be a huge help. Simply add your subject line to the text editor and wait for the tool to show you where you can make improvements. You might feel like you’ve finally narrowed it down to the perfect subject line – but what will it look like when it actually reaches your readers’ email inbox? PutsMail helps you answer that crucial question by providing a complete HTML mock-up of how your message will look. This is incredibly important because you get to step into the shoes of your recipients and see exactly what they're going to open when they read your subject line. This helps you avoid subject lines that are too long. Plus, you can also ensure your coding is good to go. The tool detects if there is an issue and finds what it might be. 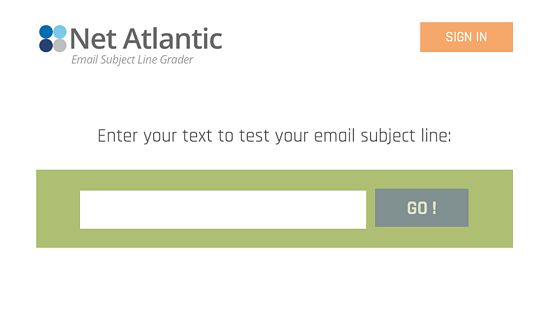 Another awesome, easy-to-use email subject line tester, Send Check It provides similar insights as the other tools listed, including scannability, reading level, and length in both characters and words. This tool gives you a comprehensive view of every aspect of your email, making it a must-have for all marketers. If your readers get confused by your subject line, they’re much more likely to mark your email as spam – reducing your email campaign deliverability in the future. Fortunately, you can avoid the spam folder thanks to the ISnotSPAM tool. It analyzes your message, including the subject line, to protect you from the spam filter. It conducts various spam tests, including SPF Check, Sender-ID Check, SpamAssassin Check, and more. 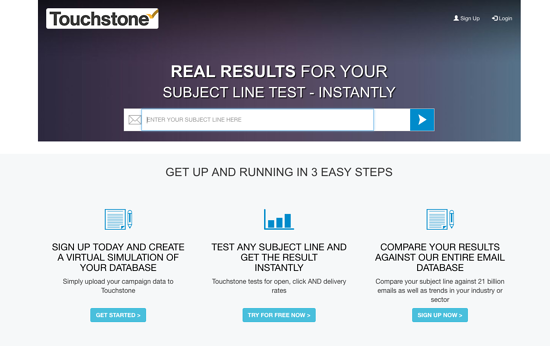 It’s not as convenient as the others – making you sign up for a free trial before you can get to the good stuff – but the Touchstone tool is definitely worth checking out. This tool is the only one that lets you create a virtual simulation of your email marketing database to test subject lines for open, click, and delivery rates. While you only get to try this for free for seven days, you might find it valuable to start with their Essential package. The full reporting dashboard can help you optimize every email marketing initiative. Plus, the tool is built to help while you scale and expand the size of your subscriber base. No matter how robust your email marketing campaigns are, your audience is likely consuming your email content on mobile devices. If your subject lines aren't optimized for the limited space on a smartphone or tablet interface, you could be hurting overall engagement in a big way. Enter TestSubject, one the easiest tools to use on this list. You simply add the sender name, subject line, and pre-header text into the appropriate fields. Then, the copy populates on a graphic for the corresponding devices you want to test on. The devices you can test your subject lines on include iPhone 6 and 6 Plus, as well as the Samsung Galaxy Note 5. The tool delivers a short description of the type of subject line you're using, details the character and word count, and analyzes the word mixture and balance. It's that simple. Last, but not least, check out this compilation of 164 email subject lines that really work, curated by OptinMonster. The subject lines are broken down into 11 powerful categories, including pain point subject lines, personal subject lines, and funny subject lines. If you need new inspiration to make your email campaigns work better than ever, try seeing how your current subjects stack up to these. At first, subject lines might look like a troublesome subject. A lot is riding on them! But think of it this way: there’s no easier and more exciting way to raise your email campaign performance in just a few minutes of work. A single phrase, usually less than 40 characters, can transform your business... that’s even more power per character than a Tweet. No matter what methods you use to craft your subjects, one thing is certain: you need to analyze your performance to figure out what really works for you! Make sure your email marketing platform (or your inbound account manager) offers detailed data on delivery rates, open rates, and clickthrough. With this information, you can refine your subject line selections over time by focusing on what resonates with your audience. Remember: always ask what your prospects and customers would be delighted to find in their email. When users realize that your messages always add value to their lives, they are that much more likely to open them, regardless of subject. Start Overcoming The 5 Biggest Email Marketing Challenges!